The icon Anapeson, or The Unsleeping Eye of Christ, is a beautiful and mystical meditation on the paradox of the incarnation of the Son of God. The very God who created and sustains the whole cosmos humbled himself to become an infant. As a man, Christ slept, being a helpless newborn baby, needing rest, food, warmth, and protection. But simultaneously, as God and Creator, Christ maintained the entire universe. 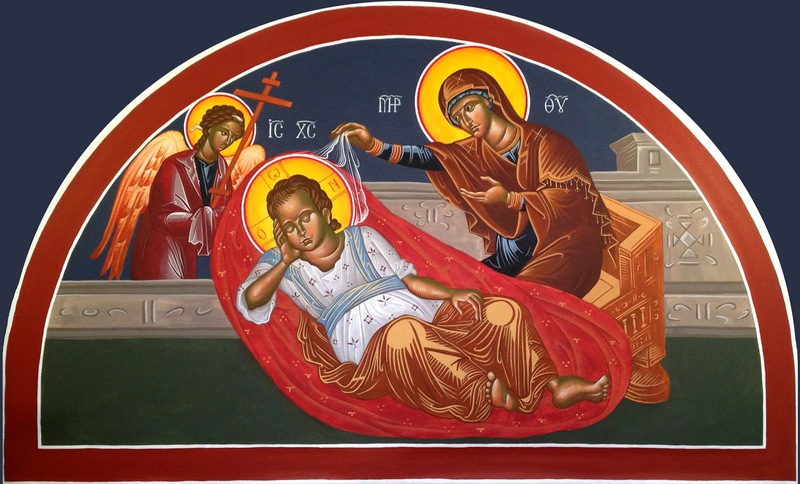 This icon depicts the infant Christ reclining in sleep, being cared for by His Mother. Christ is depicted as an infant Child, but with all of the divine attributes, namely, the halo inscribed with a cross and the Greek letters Ο ΩΝ, which is "I AM" in English: the name God told Moses in the burning bush. An angel is nearby, holding a cross, as a reference to the time when Christ would ultimately sleep in the tomb after his death on the Cross. "Judah is a lion's whelp: from the prey, my son, thou art gone up: he stooped down, he couched as a lion, and as an old lion; who shall rouse him up?" 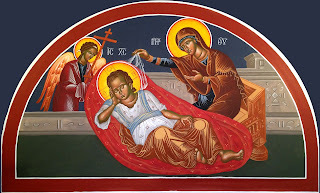 The primary prophecy related to this icon comes from the Psalms of the Prophet-King David, himself an ancestor of God, who foretold: "Behold, He shall not slumber nor shall He sleep, He that keepeth Israel." The reason that this icon is traditionally placed above the west (or back) door of an Orthodox Church comes from the latter portion of the same Psalm: "The Lord shall keep thy coming in and thy going out, from henceforth and for evermore." Holy Transfiguration Monastery (1974). Psalter According to the Seventy. I painted this icon in October 2012 for a multitude of reasons, both technical and spiritual. It is my first icon using the maroupage technique, that is, painting on canvas, then gluing the canvas to the wall to achieve the effect of a fresco/mural/wall-painting. I also wanted to work in a larger format, study from Theophanes of Crete, and paint an icon with multiple figures and architecture. I based the icon from the 16th century fresco by Theophanes of Crete, from the Katholikon (main church) of Stavronikita Monastery on Mount Athos. Theophanes is a master of line. His faces exhbit exquisite expression. My training is mostly in the Cretan school of icon painting, so in all respects, this was an appropriate prototype. The arching top of the icon harmonizes with the other arches in our church of the iconostas and the windows. I sketched directly on the canvas, which was taped to the wall in the painting studio in my house. Another benefit of the maroupage technique is that the icon can be painted under optimal lighting and other conditions. After icon was completed, and the walls of the church were painted blue, I ascended scaffolding to mount the icon to the wall. As an icon of the paradox of the incarnation, I was glad to have it finished and in place for Christmas. Chatzidakis, Manolis and Stavronikitianos, Archimandrite Vasileios (1986). The Cretan Painter Theofanis. Mount Athos, Greece: The Holy Monastery of Stavronikita.